Feast of Fools. 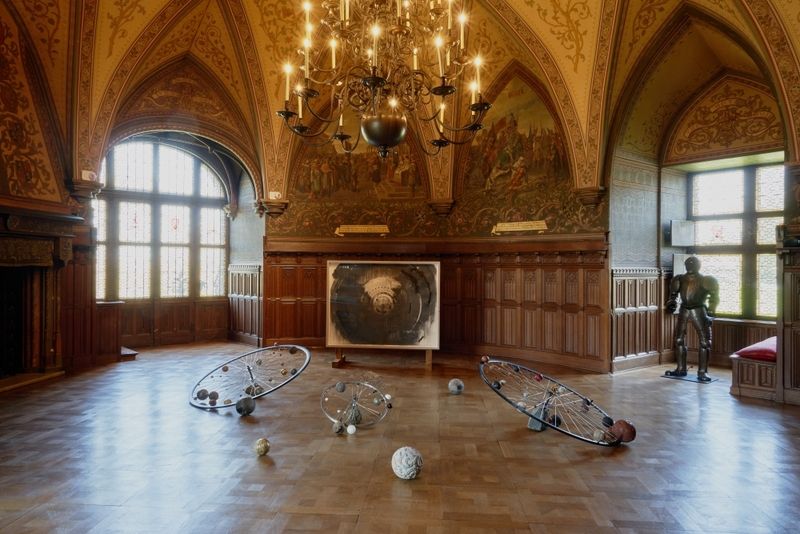 Bruegel rediscovered, installation view, Kasteel van Gaasbeek (2019). Photo by Dirk Pauwels. Pieter Bruegel is often seen as the embodiment of Flemish identity. Why has that been so since the revival of his work around 1900? How has he grown to become an icon, an inexhaustible source of inspiration and a huge cliché? In the exhibition Feast of Fools. Bruegel Rediscovered the visitor becomes acquainted with a series of key works by modern masters and new creations by contemporary artists who ‘have a thing for Bruegel’. They latch onto his themes, reinterpret them, quote him ... and thus demonstrate that his work has lost none of its relevance. The exhibition takes as its starting point ‘the great misunderstanding’, when Bruegel, in the last years of the Romance era, was proclaimed a painter of peasant psalms, crackling snow landscapes and eternally rustling cornfields, with his roots firmly in the Flemish clay. The exhibition inquires the way in which Flemish, and by extension Belgian and international artists, handled his artistic legacy in the period between and after the wars. Hence we focus on James Ensor, Valerius De Saedeleer, Jules De Bruycker, Gustave Van de Woestyne, Frits Van den Berghe, Jean Brusselmans, Constant Permeke, Anto Carte, Otto Dix, Stijn Streuvels, August Sander, Hubert Malfait and George Grosz. At the same time, the exhibition pulls out various contemporary stops, with art, video and music. In collaboration with curators Luk Lambrecht and Lieze Eeneman, a series of artists have been invited to delve into the themes from Bruegel’s work or into the interpretation of them by the generation of rediscoverers. Included artists are Lázara Rosell Albear, Kasper Bosmans, Dirk Braeckman, Ricardo Brey, Carlos Caballero, Anetta Mona Chişa & Lucia Tkáčová, Leo Copers, Jimmie Durham, Christoph Fink, Jan Van Imschoot, Bart Lodewijks, Hana Miletić, Yola Minatchy, Elisabeth Ida Mulyani, Honoré d’O, Ornaghi & Prestinari, Jonathan Paepens, Emmanuelle Quertain, Kurt Ryslavy, Sam Samiee, Pascale Marthine Tayou, Grazia Toderi, Yurie Umamoto, Birde Vanheerswynghels, Peter Verhelst & Anneleen Boehme and Gosie Vervloessem. Studio Job created a new sculpture for this exhibition, ‘The Peasant Wedding’, a rather funky homage to the great painter. The exhibition also presents a creation by Rimini Protokoll, one of Berlin’s most creative theatre companies. They developed an immersive Virtual Reality project that focuses on our contemporary food industry, with the ironic title Feast of Food. While Bruegel was alive, food was still produced close to the consumer, only gradually exotic products found their way to our tables. This had radically changed in the 21st century: the families of farmers, as depicted by Bruegel, have turned into high-tech agro-industries and the food we buy in supermarkets has become a highly customized product whose origins most of us ignore. Meanwhile, the world population has doubled in the last 50 years. Rimini Protokoll embarks on a research to find out what farming and food production look like today. You, as a visitor, will be submerged into a world in which people work for us, far from our own kitchens: from Rungis – near Paris, the biggest food market in the world – to a gigantic slaughterhouse in Bavaria or plantations in Almería. The exhibition Feast of Fools. Bruegel Rediscovered is part of the ‘Flemish Masters’ project of VISITFLANDERS, which is supporting the exhibition.